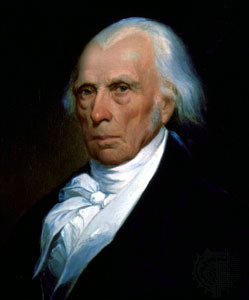 James Madison, the fourth president of the United States, was born at Port Conway, in King George county, Virginia, on the 16th of March 1751. His first ancestor in America may possibly have been Captain Isaac Maddyson, a colonist of 1623 mentioned by John Smith as an excellent Indian fighter. His father, also named James Madison, was the owner of large estates in Orange county, Virginia. In 1769 the son entered the college of New Jersey (now Princeton University), where, in the same year, be founded the well-known literary club, "The American Whig Society." He graduated in 1771, but remained for another year at Princeton studying, apparently for the ministry, under the direction of John Witherspoon (1722-94). In 1772 he returned to Virginia, where he pursued his reading and studies, especially theology and Hebrew, and acted as a tutor to the younger children of the family. In 1775 he became chairman of the committee of public safety for Orange county, and wrote its response to Patrick Henry's call for the arming of a colonial militia, and in the spring of 1776 he was chosen a delegate to the new Virginia convention, where he was on the committee which drafted the constitution for the state, and proposed an amendment (not adopted) which declared that "all men are equally entitled to the full and free exercise" of religion, and was more radical than the similar one offered by George Mason. In 1777, largely, it seems, because he refused to treat the electors with rum and punch, after the custom of the time, he was not re-elected, but in November of the same year he was chosen a member of the privy council or council of state, in which he acted as interpreter for a few months, as secretary prepared papers for the governor, and in general took a prominent part from the 14th of January 1778 until the end of 1779, when he was elected a delegate to the Continental Congress. He was in Congress during the final stages of the War of Independence, and in 1780 drafted instructions to John Jay, then representing the United States at Madrid, that in negotiations with Spain he should insist upon the free navigation of the Mississippi and upon the principle that the United States succeeded to British rights affirmed by the treaty of Paris of 1763. When the confederation was almost in a state of collapse because of the failure of the states to respond to requisitions of Congress for supplies for the federal treasury, Madison was among the first to advocate the granting of additional powers to Congress, and urged that Congress should forbid the states to issue more paper money. In 1781 he favored an amendment of the Articles of Confederation giving Congress power to enforce its requisitions, and in 1783, in spite of the open opposition of the Virginia legislature, which considered the Virginian delegates wholly subject to its instructions, he advocated that the states should grant to Congress for twenty-five years authority to levy an import duty, and suggested a scheme to provide for the interest on the debt not raised by the import duty -- apportioning it among the states on the basis of population, counting three-fifths of the slaves, a ratio suggested by Madison himself. Accompanying this plan was an address to the states drawn up by Madison, and one of the ablest of his state papers. In the same year, with Oliver Ellsworth of Connecticut, Nathaniel Gorham of Massachusetts, Gunning Bedford of Delaware, and John Rutledge of South Carolina, he was a member of the committee which reported on the Virginia proposal as to the terms of cession to the Confederation of the "back lands", or unoccupied Western territory, held by several of the states; the report was a skilful compromise made by Madison, which secured the approval of the rather exigent Virginia legislature. In November 1783 Madison's term in Congress expired, and he returned to Virginia and took up the study of the law. In the following year he was elected to the House of Delegates. As a member of its committee on religion, he opposed the giving of special privileges to the Episcopal (or any other) church, and contended against a general assessment for the support of the churches of the state. His petition of remonstrance against the proposed assessment, drawn up at the suggestion of George Nicholas (c. 1755-1799), was widely circulated and procured its defeat. On the 26th of December 1785 Thomas Jefferson's Bill for establishing religious freedom in Virginia, which had been introduced by Madison, was passed. In the Viginia House of Delegates, as in the Continental Congress, he opposed the further issue of paper money; and he tried to induce the legislature to repeal the law confiscating British debts, but he did not lose sight of the interests of the Confederacy. The boundary between Virginia and Maryland, according to the Baltimore grant, was the south shore of the Potomac, a line to which Virginia had agreed on condition of free navigation of the river and the Chesapeake Bay. Virginia now feared that too much had been given up, and desired joint regulation of the navigation and commerce of the river by Maryland and Virginia. On Madison's proposal commissioners from the two states met at Alexandria and at Mount Vernon in March 1785. The Maryland legislature approved the Mount Vernon agreement and proposed to invite Pennsylvania and Delaware to join in the arrangement. Madison, seeing an opportunity for more general concert in regard to commerce and trade (and possibly for the increase of the power of Congress), proposed that all the states should be invited to send commissioners to consider commercial questions, and a resolution to that effect was adopted (on Jan. 21, 1786) by the Virginia legislature. This led to the Annapolis convention of 1786, and that in turn led to the Philadelphia convention of 1787. In April 1787 Madison had written a paper, The Vices of the Political System of the United States, and from his study of confederacies, ancient and modern, later summed up in numbers 17, 18, and 19 of The Federalist, he had concluded that no confederacy could long endure if it acted upon states only and not directly upon individuals. As the time for the convention of 1787 approached he drew up an outline of a new system of government, the basis of the "Virginia plan" presented in the convention by Edmund Jennings Randolph. Madison's scheme, as expressed in a letter to Washington dated the 16th of April 1787, was that individual sovereignty of states was irreconcilable with aggregate sovereignty, but that the "consolidation of the whole into one simple republic would be as inexpedient as it is unattainable." He considered as a practical middle ground changing the basis of representation in Congress from states to population; giving the national government "positive and complete authority in all cases which require uniformity"; giving it a negative on all state laws, a power which might best be vested in the Senate, a comparatively permanent body; electing the lower house, and the more numerous, for a short term; providing for a national executive, for extending the national supremacy over the judiciary and the militia, for a council to revise all laws, and for an express statement of the right of coercion; and finally, obtaining the ratification of a new constitutional instrument from the people, and not merely from the legislatures. The "Virginia plan" was the basis of the convention's deliberations which resulted in the constitution favorably voted on by the convention on the 17th of September 1787. Among the features of the plan which were not embodied in the constitution were the following: proportionate representation in the Senate and the election of its members by the lower house "out of a proper number of persons nominated by the individual legislatures"; the vesting in the national Congress of power to negate state acts; and the establishment of a council of revision (the executive and a convenient number of national judges) with veto power over all laws passed by the national Congress. Madison, always an opponent of slavery, disapproved of the compromise (in Article I Section 9 and Article V) postponing to 1808 (or later) the prohibition of the importation of slaves. He took a leading part in the debates of the convention, of which he kept full and careful notes, afterwards published by order of Congress (3 vols., Washington, 1843.) Many minute and wise provisions are due to him, and he spoke before the convention more frequently than any delegate except James Wilson and Gouverneur Morris. In spite of the opposition to the constitution of the Virginia leaders George Mason and E. J. Randolph, Madison induced the state's delegation to stand by the constitution in the convention. His influence largely shaped the form of the final draft of the constitution, but the labor was not finished with this draft; that the constitution was accepted by the people was due in an eminent degree to the efforts of Madison, who, to place the new constitution before the public in its true light, and to meet the objections brought against it, joined Alexander Hamilton and John Jay in writing The Federalist, a series of eighty-five papers, out of which twenty certainly, and nine others probably, were written by him. In the Virginia convention for ratifying the constitution (June 1788), when eight states had ratified and it seemed that Virginia's vote would be needed to make the necessary nine (New Hampshire's favorable vote was cast only shortly before that of Virginia), and it appeared that New York would vote against the constitution if Virginia did not ratify it, Madison was called upon to defend that instrument again, and he appeared at his best against its opponents, Patrick Henry, George Mason, James Monroe, Benjamin Harrison, William Grayson and John Tyler. He answered their objections in detail, calmly and with an intellectual power and earnestness that carried the convention. The result was a victory against an originally adverse public opinion and against the eloquence of the opponents of the constitution, for Madison and for his lieutenants, Edmund Pendleton, John Marshall, George Nicholas, Harry Innes and Henry Lee. At the same time Madison's labors in behalf of the constitution alienated from him valuable political support in Virginia. He was defeated by Richard Henry Lee and William Grayson in his candidacy for the United States Senate, but in his own district he was chosen a representative to Congress, defeating James Monroe, who seems to have had the powerful support of Patrick Henry. Madison took his seat in the House of Representatives in April 1789, and assumed a leading part in the legislation necessary to the organization of the new government. He drafted a Tariff Bill giving certain notable advantages to nations with which the United States had commercial treaties, hoping to force Great Britain into a similar treaty; but his policy of discrimination against England was rejected by Congress. It was his belief that such a system of retaliation would remove the possibility of war arising from commercial quarrels. He introduced resolutions calling for the establishment of three executive departments, foreign affairs, treasury and war, the head of each removable by the president. Most important of all, he proposed nine amendments to the constitution, embodying suggestions made by a number of the ratifying states, especially those made by Virginia at the instance of George Mason; and the essential principles of Madison's proposed amendments were included in a Bill of Rights, adopted by the states in the form of ten amendments. The absence of a Bill of Rights from the constitution as first adopted had been the point on which the opposition had made common cause, and the adoption of this now greatly weakened the same opposition. Although a staunch friend of the constitution, Madison believed, however, that the instrument should be interpreted conservatively and not be made the means of introducing radical innovations. The tide of strict construction was setting in strongly in his state, and he was borne along with the flood. It is very probable that Jefferson's influence over Madison, which was greater than Hamilton's, contributed to this result. Madison now opposed Hamilton's measures for the funding of the debt, the assumption of state debts, and the establishment of a National Bank, and on other questions he sided more and more with the opposition, gradually assuming its leadership in the House of Representatives and laboring to confine the powers of the national government within the narrowest possible limits; his most important argument against Hamilton's Bank was that the constitution did not provide for it explicitly, and could not properly be construed into permitting its creation. Madison, Jefferson. and Randolph were consulted by Washington, and they advised him not to sign the bill providing for the Bank, but Hamilton's counterargument was successful. On the same constitutional grounds Madison objected to the carrying out of the recommendations in Hamilton's famous report on manufactures (Dec. 5, 1791), which favored a protective tariff. In the presidential campaign of 1792 Madison seems to have lent his influence to the determined efforts of the Jeffersonians to defeat John Adams by electing George Clinton Vice President. In 1793-1796 he strongly criticized the administration for maintaining a neutral position between Great Britain and France, writing for the public press five papers (signed "Helvidius"), attacking the "monarchical prerogative of the executive" as exercised in the proclamation of neutrality in 1793 and denying the president's right to recognize foreign states. He found in Washington's attitude -- as in Hamilton's failure to pay an installment of the monies due France -- an "Anglified complexion", in direct opposition to the popular sympathy with France and French Republicanism. In 1794 he tried again his commercial weapons, introducing in the House of Representatives resolutions based on Jefferson's report on commerce, advising retaliation against Great Britain and discrimination in commercial and navigation laws in favor of France; and he declared that the friends of Jay's treaty were "a British party systematically aiming at an exclusive connection with the British government", and in 1796 strenuously but unsuccessfully opposed the appropriation of money to carry this treaty into effect. Still thinking that foreign nations could be coerced through their commercial interests, he scouted as visionary the idea that Great Britain would go to war on a refusal to carry Jay's treaty into effect, thinking it inconceivable that Great Britain "would wantonly make war" upon a country which was the best market she had in the world for her manufactures, and one with which her export trade was so much larger than her import. In 1797 Madison retired from Congress, but not to a life of inactivity. In 1798 he joined Jefferson in opposing the Alien and Sedition Laws, and Madison himself wrote the resolutions of the Virginia legislature declaring that it viewed "the powers of the Federal government as resulting from the compact to which the states are parties, as limited by the plain sense and intention of the instrument constituting that compact; as no further valid than they are authorized by the grants enumerated in that compact; and that, in case of a deliberate, palpable and dangerous exercise of other powers, not granted by the said compact, the states, who are parties thereto, have the right and are in duty bound to interpose for arresting the progress of the evil, and for maintaining within their respective limits, the authorities, rights and liberties appertaining to them." The Virginia resolutions and the Kentucky resolutions (the latter having been drafted by Jefferson) were met by dissenting resolutions from the New England states, from New York, and from Delaware. In answer to these, Madison, who had become a member of the Virginia legislature in the autumn of 1799, wrote for the committee to which they were referred a report elaborating and sustaining in every point the phraseology of the Virginia resolutions. Upon the accession of the Republican party to power in 1801, Madison became secretary of state in Jefferson's cabinet, a position for which he was well fitted both because he possessed to a remarkable degree the gifts of careful thinking and discreet and able speaking, and of large constructive ability; and because he was well versed in constitutional and international law and practised a fairness in discussion essential to a diplomat. During the eight years that he held the portfolio of state, he had continually to defend the neutral rights of the United States against the encroachments of European belligerents; in 1806 he published An Examination of the British Doctrine which subjects to Capture a Neutral Trade not open in Time of Peace, a careful argument -- with a minute examination of authorities on international law -- against the rule of war of 1756 extended by Great Britain in 1793 and 1803. During Jefferson's presidency and whilst Madison was secretary of state, by the purchase of Louisiana, Madison's campaign begun in 1780 for the free navigation of the Mississippi was brought to a successful close. The candidate in 1808 of the Republican party, although bitterly opposed in the party by John Randolph and George Clinton, Madison was elected president, defeating C. C. Pinckney, the Federalist candidate, by 122 votes to 47. Madison had no false hopes of placating the Federalist opposition, but as the preceding administration was one with which he was in harmony, his position was different from that of Jefferson in 1801, and he had less occasion for removing Federalists from office. Jefferson's peace policy -- or, more correctly, Madison's peace policy -- of commercial restrictions to coerce Great Britain and France he continued to follow until 1812, when he was forced to change these futile commercial weapons for a policy of war, which was very popular with the extreme French wing of his party. There is a charge, which has never been proved or disproved, that Madison's real desire was for peace, but that in order to secure the renomination he yielded to that wing of his party which was resolved on war with Great Britain. The only certain fact is that Madison, whatever were his personal feelings in this matter, acted according to the wishes of a majority of the Republicans; but whether in doing so he was influenced by the desire of another nomination is largely a matter of conjecture. Madison was renominated on the 18th of May 1812, issued his war message on the 1st of June, and in the November elections he was re-elected, defeating De Witt Clinton by 128 votes to 89. His administration during the war was pitiably weak. His cabinet in great part had been dictated to him in 1809 by a senatorial clique, and it was hopelessly discordant; for two years he was to all intents and purposes his own secretary of state, Robert Smith being a mere figurehead of whom he gladly got rid in 1811, giving James Monroe the vacant place. Madison himself had attempted alternately to prevent war by his "commercial weapons" and to prepare the country for war, but he had met with no success, because of the tricky diplomacy of Great Britain and of France, and because of the general distrust of him coupled with the particular opposition to the war of the prosperous New England Federalists, who suggested with the utmost seriousness that his resignation should be demanded. In brief, Madison was too much the mere scholar to prove a strong leader in such a crisis. The supreme disgrace of the administration was the capture and partial destruction in August 1814 of the city of Washington -- this was due, however, to incompetence of the military and not to any lack of prudence on the cabinet's part. In general, Congress was more blamable than either the president or his official family, or the army officers. With the declaration of peace the president again gained a momentary popularity much like that he had won in 1809 by his apparent willingness at that time to fight France. Retiring from the presidency in 1817, Madison returned to his home, Montpelier (in Orange county, Virginia), which he left in no official capacity save in 1829, when he was a delegate to the state constitutional convention and served on several of its committees. Montpelier, like Jefferson's Monticello and Monroe's Oak-Hill, was an expensive bit of "gentleman farming", which with his generous Virginia hospitality nearly ruined its owner financially. Madison's home was peculiarly a centre for literary travellers in his last years; when he was eighty-three he was visited by Harriet Martineau, who reported her conversations with him in her Retrospect of Western Travel (1838). He took a great interest in education -- his library was left, to the university of Virginia, where it was burned in 1895 -- in emancipation, and in agricultural questions, to the very last. He died at Montpelier on the 28th of June 1836. Madison married, in 1794, Dorothy Payne Todd (1772-1849), widow of John Todd, a Philadelphia lawyer. She had great social charm, and upon Madison's entering Jefferson's cabinet became "first lady" in Washington society. Her plump beauty was often remarked -- notably by Washington Irving -- in contrast to her husband's delicate and feeble figure and wizened face -- for even in his prime Madison was, as Henry Adams says, "a small man, quiet, somewhat precise in manner, pleasant, fond of conversation, with a certain mixture of ease and dignity in his address." Her son, spoiled by his mother and his step-father, became a wild young fellow, and added his debts to the heavy burden of Montpelier upon Madison. Madison's portrait was painted by Gilbert Stuart and by Charles Willson Peale; Giuseppe Ceracchi made a marble bust of him in 1792 and John H. J. Browere another in 1827, now in possession of the Virginia Historical Society at Richmond. Though commonly dignified and a little stiff he seems to have had a strong sense of humour and he was fond of telling a good story. Henry Clay, contrasting him with Jefferson, said that Jefferson had more genius, Madison more judgment and common sense; that Jefferson was a visionary and a theorist; Madison cool, dispassionate, practical, and safe. The broadest and most accurate scholar among the "founding fathers", he was particularly an expert in constitutional history and theory. In the great causes for which Madison fought in his earlier years -- religious freedom and separation of church and state, the free navigation of the Mississippi, and the adoption of the constitution -- he met with success. His greatest and truest fame is as the "father of the Constitution." The "commercial weapons" with which he wished to prevent armed conflict proved less useful in his day than they have since been in international disputes.